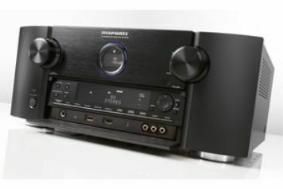 Flagship Marantz AV receiver hits the shops next month | What Hi-Fi? Other Audyssey technologies onboard include DSX processing to provide additional speakers at the front-wide area, Dynamic EQ for listening at low volumes and Dynamic Volume to equalise out differing levels when viewing. A built-in media player handles streaming music and still images, plus internet radio, there's a USB input offering digital connection for iPods, and the Marantz M-XPort will connect adapters including the RX101 Bluetooth receiver. The amplifier section delivers 7x125W, and the SR7005 will be available in black or silver.